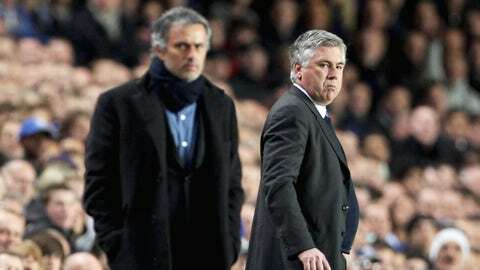 Carlo Ancelotti has backed Chelsea boss Jose Mourinho to end his side's poor start to the season. Carlo Ancelotti has told Chelsea fans not to worry because Jose Mourinho is "the right man" to stop the rot at Stamford Bridge. The Blues suffered their fifth defeat in 10 matches on Saturday at Upton Park as Mourinho’s side continued their worst ever start to a Premier League season. Reports have suggested that Mourinho’s job could be in jeopardy but former Chelsea and Real Madrid boss Ancelotti is confident that the Portuguese will turn things around. "I did not expect this crisis, but I understand the reasons for these problems," Ancelotti told La Gazzetta dello Sport. "I think they are feeling satiated. "Last year they won by a huge margin, and now they are more relaxed. Don’t worry, Mourinho will put everything back in order, he is the right man." Ancelotti, who was linked with he Liverpool job before Jurgen Klopp was appointed, believes the title race will be close and the Italian says Manchester City and Arsenal are the two teams to watch. "Manchester City are the most complete team in the Premier League, but occasionally they switch off," he continued. "They are not 100 percent reliable. "I’d watch out for Arsenal. Arsene Wenger did well to change their system, so he waits and counters to get the best out of the pace of Theo Walcott and Alexis Sanchez."